If you’re looking for a business file storage provider, I would look elsewhere. If you’re looking for a personal usage solution, then Justcloud and it’s options will work just fine for you. JustCloud is one of the many companies owned by Just Develop It. JDI’s first product was the Intellichat, an automated chat agent designed to reduce web site abandonment, in 2008. In the years that followed, JDI started, and in some cases sold, a number of different companies, both web-related and non-web related. Some of these ventures include a dating web site, web hosting services, a night club, and a country club. JustCloud was launched in 2010. 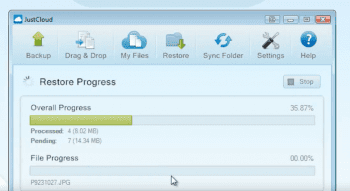 Just Develop It is also the parent company of the other backup solutions ZipCloud, Backup Genie, and MyPCBackup. There is a 30 day money back guarantee. The default setting is to auto-renew subscription, but you can change this or cancel your service at any time. 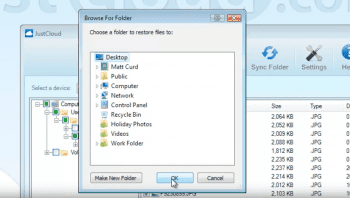 JustCloud will not delete files for life of subscription. They let you access previous file versions for seven days. Will not backup operating system, application files, or temporary Internet files. Once you set your backup schedule, it will silently run in the background. Business, $35.94/mo: 100 GB of storage space to be shared by 5 computers; additional computers $2.95/mo each; additional storage space $4.95/mo per 100 GB; iOS and Android mobile app; file sharing; online control panel; unlimited file versioning; locate lost/stolen laptop; drag and drop backup. Enterprise, $71.94/mo: 500 GB of storage to be shared by 20 computers; additional computers $2.95/mo each; additional storage space $4.95/mo per 100 GB; iOS and Android mobile app; file sharing; online control panel; unlimited file versioning; locate lost/stolen laptop; drag and drop backup. 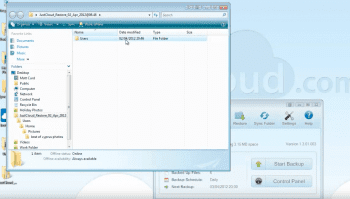 JustCloud uses Google Cloud Storage servers, which have yet to lose even a single file. The guaranteed uptime is an astounding 99.99999999%, which is 0.004 seconds per year. The data is stored redundantly both within the same facility and in secondary facilities. Google’s data centers are housed in America and Europe, but their exact location is not disclosed for security reasons. JustCloud also allows vendors to resell cloud space, starting as low as $19.14/mo. Vendors are permitted to set their own pricing and brand the product as their own. JustCloud is compatible with all major mobile platforms, including Kindle Fire and Windows Phone. 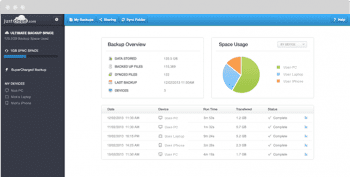 They make it easy to backup multiple devices and access your files from anywhere. JustCloud has a feature that can track a lost or stolen device by the last place it used the Internet. Although this system is not foolproof, it is an invaluable tool to help the police recover your property. Even if the device is never found, all the data can be easily restored. Anyone with a number of different mobile devices should look into JustCloud. What Do You Think of JustCloud?